Sometimes the fish aren’t biting and you fill the void with the predictable chatter. Dream Fish. Dream Destinations. Dream Skiffs. Flashback to Fall of 2014. I was at work, clicking around in the Microskiff forum instead of doing whatever I was supposed to be doing. I was new-er to flats fishing and extremely new to flats skiffs, so every thread was an opportunity to learn something new. I clicked on a thread in the Classified section for a “Hann Nano”, and as the pictures of the skiff loaded, it was like a fuse was lit inside my brain. I’d never seen anything like it, before. It was as if a mad scientist pointed his Shrink Ray at a “normal” skiff and downsized it by 25%. The lines were perfect – how had I never heard of this boat? I went crazy looking for information online about the Nano. There was no Facebook page. No website. No sales records. No build threads. No reviews. Nothing tagged #HANNNANO on social media. The Hann website was loaded with huge powerboats - a cruelly ironic fact, given the scale of the craft I was looking for. It all seemed so improbable. How could any product - let alone a micro skiff this specialized and exciting - have ever been produced and been able to exist without any online record aside from a few forum threads? This fact only served to intensify my curiosity and borderline obsession with this boat. I didn’t know anyone who had one, I didn’t know anywhere to see one, and I certainly had no idea how I would ever get a ride on one. The information I found on the forums did fill in some of the blanks but did not fill me with hope of ever laying eyes on a Nano. I read that the boat had been produced, initially, as the Hells Bay Skate. I knew Hells Bay, of course, but had never heard of the Skate. There was definitely more information returned with the search terms “HELLS BAY SKATE” than I had found with “HANN NANO,” but it still left me with more questions than answers. In my digging, I found a pdf of the Skate brochure, which contained the specs at which I had only been guessing, previously. Twelve feet, nine inches long with a 3.5” draft? Damn. I couldn’t find anything about why HB had stopped producing the skiff. A dead end, but then the skiff pops back up as the Hann Nano for a brief interval, and then… nothing. Another dead end awash in swirling, fantastic rumors. Someone said the molds had been sold to a company in the Bahamas. Another said the owner took them to Costa Rica. Another said they’d been destroyed in a hurricane. One even said that the molds were sold to a builder in Cuba and that Fidel Castro himself had ordered the operation shuttered and that until the island was free and democratic there would be no more Nanos. CUBA? If Castro could outlast the last 11 American Presidents, he could probably outlast my quest to see this little boat, right? There was absolutely no evidence online for or against any of these wild tales, so any of them might have been true. Disheartened and discouraged, I climbed out of the Nano rabbit hole. Some time later, an HB Skate popped up for sale on Microskiff, causing a flurry of conversation on the forum before being snapped up the same week. My baby boy had just been born, and I didn’t even see the thread until the boat was long gone. It was exciting to see new photos of the boat I’d been chasing, but the reinvigoration of old curiosities lead to the same dead ends and the same begrudged resignation to the seemingly inescapable fact that I would never see this boat in person. Later still, a thread was started by someone who had apparently arrived at the exact same depressing dead end as myself. The author was looking for information on the hull and hadn’t found anything online. I scrolled through the thread and came to a comment by a user named MyakkaRed. I re-read the sentence several times in stunned disbelief. Just like that. Some guy on microskiff just happens to own the molds. I left a comment, sent a direct message, and waited. A reply came through with a telephone number – and it had our local area code. (WHAT?) Alain answered on the second ring and I gave a breathless, overly-enthusiastic, extremely disorganized version of the story you’ve read, to this point. As I think back to how I must’ve sounded, it’s a wonder that he didn’t call me a stalker or immediately hang up and block my number. He even chuckled at the Cuba-Castro-thing. The molds were his. They were not destroyed in a hurricane – they’re at his house. I am giddy. This all began with a guy named Reid Zoller. Reid was the North American sales rep. for Loop fly fishing tackle and living in Sarasota. Reid had built several wooden skiff over the years in his home garage and went by the name of DitchCraft. Working for Loop Tackle allowed Reid to fish all the best places and experience firsthand a lot of kayaks & skiffs and determine what works and what doesn’t. During this time, Reid owned a popular “18’ fishing canoe / skiff” it served him well but on one occasion fishing with his young son the skiff turned turtle on them. This set the ball in motion. His initial concept was to design a skiff that can be paddled standing up without a motor allowing an angler to fish no motor zones i.e. : Mosquito Lagoon etc. I’ve worked in the recreation fiberglass boating industry for 31 years. Hard to believe but 31 years ago, I was chasing resin bubbles with a roller and slinging a grinder. Through hard work and determination, I worked my way up. Always in the product and development side for several very well know boat companies and composite tooling shops. I also worked as a Compliance Specialist ensuring my companies products met USCG / ABYC / NMMA / CE approval. Was Quality Assurance Manager for two highly respected boat companies. I was product manager overseeing new models from design on through to manufacturing phase in. Spent 16 of those years in the composite tooling business where I was the face of the company reaching out to customers winning their trust and confidence allowing me to quote and manage their projects. Reid approached me back in or around 2008 while I was project manager for a composite tooling and design company in S.W. FL. 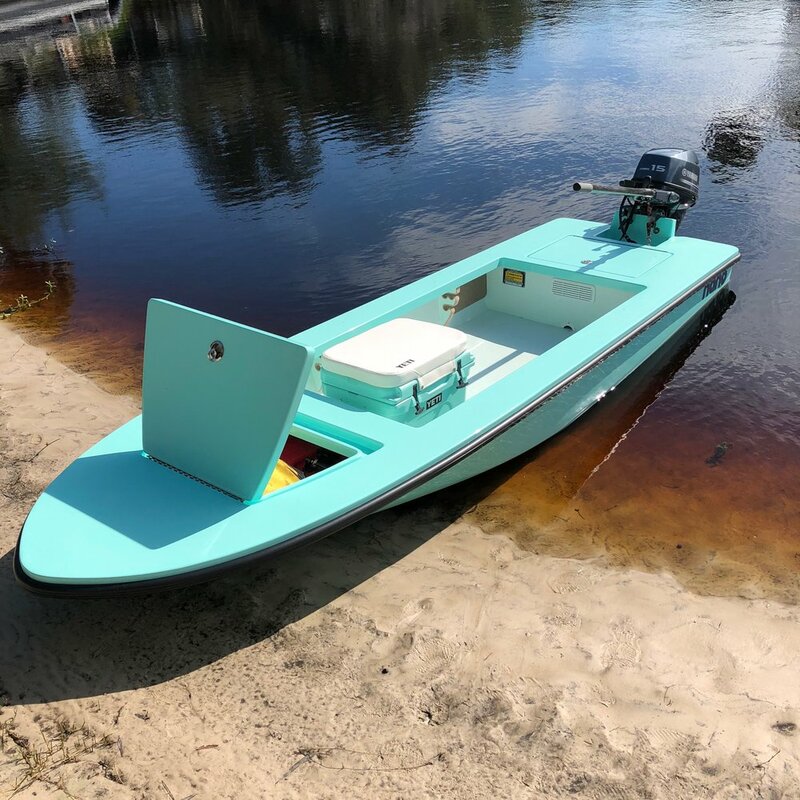 He brought in his plans and ideas to design and tool up a 13’ technical poling skiff consisting of the hull, deck and two storage compartment hatches. Reid, the naval architect from the tooling shop and I hashed out the details and created a 3D CAD model of his new boat. Once designed and approved we decided to machine the hull as a female form (temporary mold) out of EPS foam (Styrofoam). This was the first time the shop tooled up a mold using EPS to pull production parts. There were a few advantages using EPS 1) it’s cost effective 2) quick time frame i.e. : skipping the male plug all together and machine the design direct to mold. This help to evaluate “proof of concept” prior to committing to expensive full blown production molds. The original design incorporated a hull deck joint called a rolled edge where the hull and deck overlap onto one another and form a down turned lip to deflect spray. This meant if the deck had a 45” beam, the hull had 44.5” but the hull top side beam was only at 40.5” . We laminated the prototype at the tooling shop, Reid picked it up, rigged his motor and went to water. He discovered it was too tender. So back to the drawing board…..We kept the deck design as it was and redesigned the hull by bumping the sides out approx. 2” per side to gain beam / stability. This changed the hull / deck joint from a rolled edge to a more conventional “shoe box” or “coffee can” type hull deck joint. With the hull beam maxed out, we finalized the design and machined a male plug under the 5 axis router holding a tolerance of .005”. From there, the composite production molds were created. During the tooling phase of the fiberglass DitchCraft, Reid and the owners of Hells Bay struck a builders’ agreement where H.B. would build the DitchCraft Skate. This became known as the Hells Bay Skate. As best as I can determine by counting the drill dimples in the deck mold, where H.B. employees drilled through the laminate of the hatch cut outs to inject air in order to assist with releasing the part from the mold, I believe there were 6 H.B. Skates produced in 2009 / 2010. Summer of 2011, I noticed H.B. had taken the Skate out of the model lineup. Having firsthand knowledge of the quality that went into the design, construction of the plugs and molds, I called Reid, who was now living in Stockholm Sweden and working for Loop. I expressed my interest in buying the tooling and producing the boats myself. Long story…. Reid, the owners of H.B., and I struck a three way purchase agreement and my wife and I were now the proud owners of the DitchCraft Skate molds. I signed a builder’s agreement with a boat builder in Sarasota to build these for us under contract for our company “nano” in 2011 - 2012. Hann Powerboats built seven nano’s. Five Castle Tan ones for a resort in the Islands, a Fighting Lady Yellow was our personal show boat and a Matterhorn White nano. The molds went into storage from 2013 – 2017. Best described as “life getting in the way”. Many stories have been told during their hibernation and that’s why we think it’s important to lay it out for people to understand how it came to be. 2017: Traveling back and forth to work for a well-known boat builder in Tampa, with a 1.5 hour commute each way (on a good day and sometimes 3 or 4 hrs. on a bad traffic day) Monday – Saturday, gave me a lot of windshield time to think and begin to reevaluate ‘things.’ After many, many conversations, my wife and I decided if we weren’t going to bring the Nano back to life now, when would we. We had our answer and that’s when we decided to bring the Nano to market and the builder would be us. Now, my wife and I are the proud owners of NanoCraft Boats where we believe we build the best 13’ skiff, hands down. Alain was in final preparations for the launch of the Nanocraft website and invited me out to his home on the Myakka River (NOT Costa Rica) to check out the skiff. I could hardly believe this was real. My buddy, Jess, and I picked a sunny Sunday to visit. My initial impression of Alain following our phone conversation was the he was amiable and intelligent, and meeting with him in-person both confirmed and deepened that belief. He was brimming with energy and enthusiasm for the Nano 13, specifically, and skiff building, in general. We started with a tour of his workshop, wherein we got to see and touch the gleaming molds that had occupied so much of my imagination over the last few years. Quite a moment, I have to say. He showed us some dizzyingly complex trials he had recently conducted with various resin materials – exactly the type of process improvement analytics you would want in a skiff builder. Alain had a freshly finished Nano 13 in the shop and spoke with amazing command and fluency about every inch of the craft. It was incredible. The lines and proportions were every bit as elegant as I had dreamed. The construction was perfect. It was light while still extremely solid. Edges were flawlessly smooth. Fit & Finish were absolutely superb and definitely on-par with the nicest skiffs on which I’ve ever fished. The color of the gelcoat was so richly beautiful that it looked as though you could dive right into it. What an incredible boat. ‘All previous Skates and nanos had the USCG capacity rating as 2 persons or 300 lbs. max persons / motor and gear 450 lbs. with a 15 H.P. max. In 2018, the USCG came out with their new Weights Table 183.75. This chart pertains specifically to the engine and related gear based on H.P. range. From what I understand it was revised to capture the weights for 4 stroke O/B engines as they are today. This new chart for the H.P. range in which the Nano 13 falls mandates we compensate 221 lbs. for engine and related gear (11.0 – 22.0 h.p.). This 221 lbs. per their chart is subtracted from the 450 lbs. max weight leaving a persons capacity of 229 lbs. I went around the farm with the USCG head engineer in Washington D.C. and attempted to apply for an exemption to bring us back to the 2 persons / 300 lbs. but it was to no avail. I explained we equip our boats with 148 lbs. of pertinent equipment - less than their chart allocation of 221 lbs. For example they say a battery weight should be 45 lbs., ours is 8 lbs. (PWC U 1 battery), they claim full portable fuel weight as 50 lbs., ours is 22 lbs. (3 gal w/tank), they claim helm controls and rigging as 6 lbs., we have zero (always tiller steer). So you can easily see a Nano 13 should have the 2 persons 300 lbs. rating and it would not create a safety concern to passengers or operator. When we float tested our boat for USCG Upright and Level Flotation and Max. Weight Capacity / Safe Loading, we first did the calculations and then physically swamped our boat in the swimming pool to validate the calculations. In both tests, we were using the 2 persons / 300 lbs. rating (not 229 lbs.) and we even added additional weights to the point the deck became awash (swamped). A nano 13 as we build them was proven to exceed the USCG requirements. When we presented the facts to the USCG head engineer, he still would not grant us the exemption and he did not feel the reduction in persons capacity from 300 lbs. to 229 lbs. would create a hardship. Obviously he is not in sales & marketing. Alain was quick to provide the reasoning behind this particular boat’s layout but also discussed a myriad of custom options available during the build process. He explained that advances in technology and materials make the Nano 13 the strongest version of the craft ever produced. Alain was clearly very proud of the boat that sat before us, and for good reason. For the wet test, Alain had 2 Nano 13 models waiting for us on the beach - one with a 9.9 Mercury and the other with a 15 Yamaha. Both were sitting in what looked like almost No Water, but would glide effortlessly with a slight nudge. For all the (sometimes heated) forum threads I’ve read about draft numbers, actually seeing a skiff floating freely in 4” of water gave a shocking perspective to how “skinny” that really is. If you can’t reach a spot in the Nano 13, the fish can’t, either. As I stepped onto the deck and pushed off from the beach, I was immediately struck by how well-balanced the boat was. Admittedly, the water was flat and I was alone, but the hull was far more stable than I was expecting, given the 45” beam. It’s obviously not a barge, but I have felt less surefooted while on the bow of larger skiffs than the Nano 13. It never occurred to me to keep on the centerline as I moved around the deck. The skiff responded predictably to weight shifts but I never once worried about losing my balance and going for a swim. The river was running and we both climbed all over our respective boats as we drifted, getting the feel for the hull. I watched as Jess negotiated the entire outside perimeter of the skiff without flailing his arms – and all while keeping his toes dry. If you did slide into the water – intentionally or otherwise – the stability of the craft left little doubt in my mind that re-boarding without tipping or swamping would be safe and easy. We waved goodbye to Alain as we drifted around the bend and then twisted the throttle through the first straightaway. The response was immediate and the boats popped onto plane effortlessly. Both examples were very quick and extremely responsive, and although we both preferred the immediacy and extra top-end that the 15hp provided, the 9.9 did not feel underpowered. We probably did not stick as closely to the official “Wake Zone” guidance as we ought to have, if I’m being completely honest, but anyway… the excitement of carving around the bends in the river before cranking the throttle into the next straightaway was impossible to resist. Both boats had Tiller Extension handles installed, helping keep the weight forward and the nose down with a single angler onboard. An iced-down Yeti or a second fisherman upfront would obviously accomplish the same goal. A lone angler sitting on the back hatch caused a bit of predictable porpoising at top speed, but the effect was completely abated by standing at mid-boat while underway. We worked our way up some twisting arms of the Myakka to fish a couple of spillway spots that would have been impossible to access in a 17’ boat. Tight tunnels and skinny sandbars were no impediment to the Nano 13. It was surprising and hilarious when we realized that the boat had so easily maneuvered us into spots from which we couldn’t even raise our 9’ fly rods, let alone cast a fly. 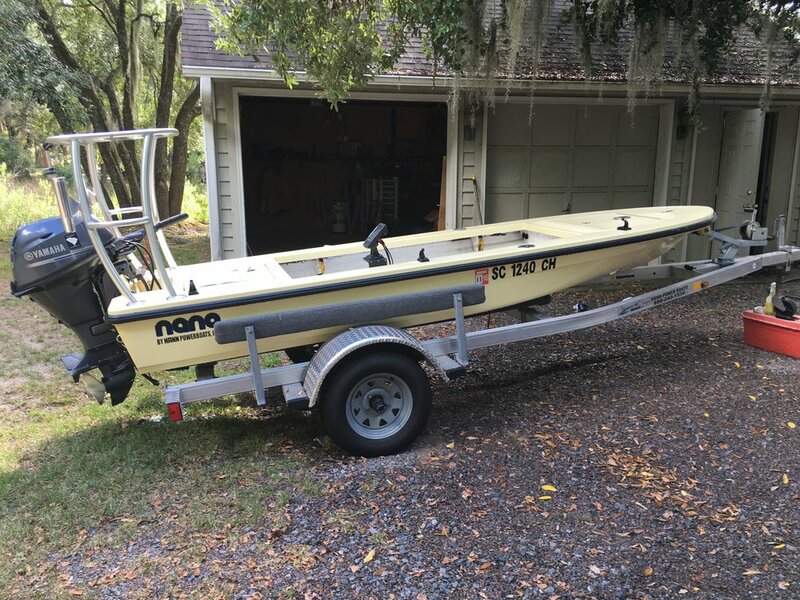 Obviously, we’re all well-accustomed to polite nods and waves at passing boats while we’re out on the water, but I’ve never seen a boat grab the attention of others like the Nano 13. We were stopped by over a dozen boaters to ask us about the Nano 13. Everything about the boat demands attention – especially as you zoom past other boats that are stuck waiting for the tide to roll in to make it to the spot that you’re already be fishing. Overall, the wet test was a day filled with excitement, adventure, and tremendous fun. The boat that had captivated and consumed me was everything I had hoped it would be. My ultimate conclusion following the comprehensive, emotional arc of my experience with this skiff is that I cannot imagine a better craft for the intended purpose of the Nano 13. It does everything that it was designed to do with flawless precision and impeccable style. There is a novelty that we assign to smaller versions of things that trades away some of the seriousness of the original. I’m not immune to that, which is probably why I keep returning to words like “Serious” and “Solid” to describe the Nano 13 when I wouldn’t feel as compelled to use them if the boat was 17 feet long. The Nano 13 is not the boating equivalent of a Pocket Motorbike or a Razor Scooter or a Micro Drone. The Nano 13 is every bit as serious a fishing machine as any top skiff on the market. “We know we entered into a very specialized market by building a 13’ skiff. We believe our nano 13 checks a lot of boxes for anglers. Its small, light, simple, easy to tow, easy to maintain, economical to run, very well built and stylish for a small skiff. That dedication is abundantly clear the moment you see the Nano 13, in person. If your goal is to fish skinny, fish solo, or fish quietly, I strongly recommend that you check out the Nano 13. It is the Right Tool for the Job. I was chatting with a friend about my experience with the Nano 13, and I used the term “micro-microskiff” to describe it. There it was. My “One in a Billion” Skiff. The Nano 13. Occupancy: 2 people 229 lbs.